Spring semester dates begin Jan. 31 at the Multicultural Center. Healing from Racial Injustices is a group for students, staff, and faculty of color to build community, share experiences as a person of color, and heal together. 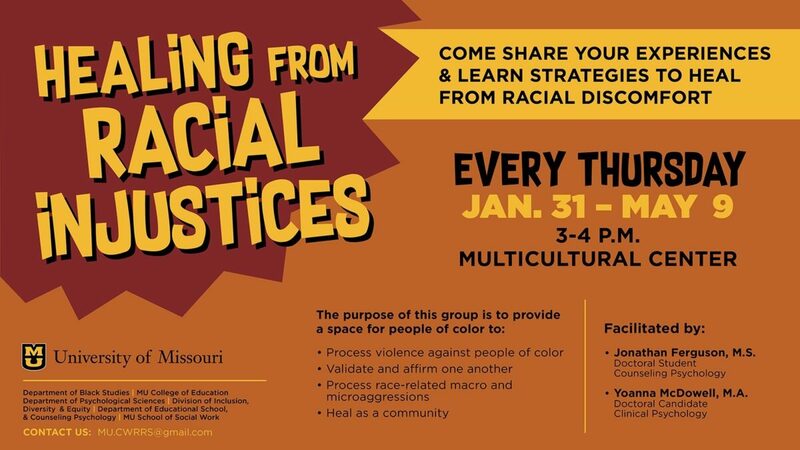 The group meets 3-4 p.m. Thursdays in the Multicultural Center from Jan. 31-May 9. In the past, discussions have covered navigating predominantly white spaces, mental health effects of domestic terrorism, methods of activism, allyship, identity development, and much more. They also incorporate skills for healing through the use of emotion-regulation, mindfulness, and distress tolerance strategies. If you have questions or would like to be added to the listserv to receive updates and RSVP for meetings, please email mu.cwrrs@gmail.com.